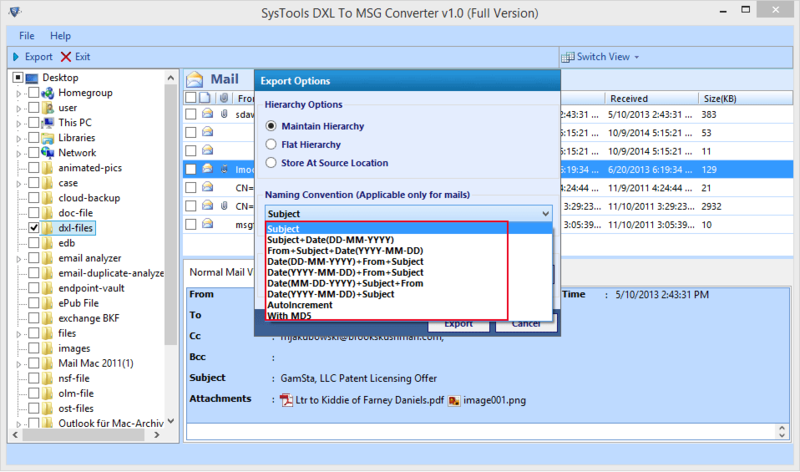 The tool helps an individual to export .dxl messages of IBM Notes to Outlook MSG file. It is an independent platform where users can perform the batch migration. This means that hundreds or more DXL files can be moved to MSG all in one go. 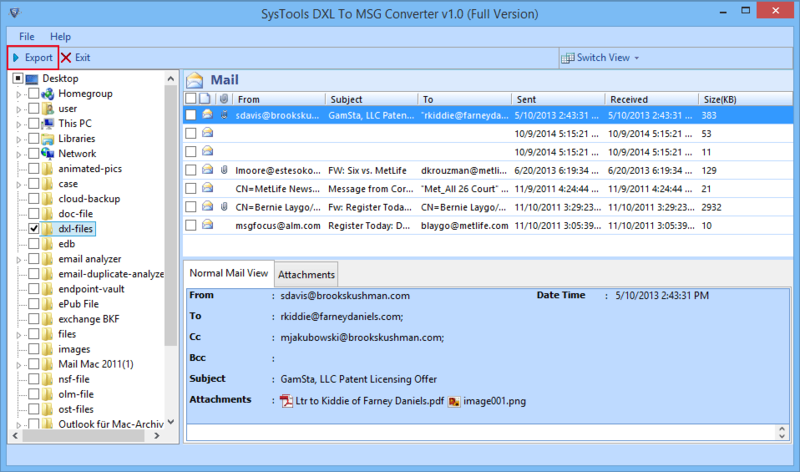 DXL File to MSG Converter offers a smart feature to automatically detect and load DXL files from the folder. This reduces time that might get devoted while separately browsing files. Once the files are loaded, users can preview messages with all technical properties and attachments too. 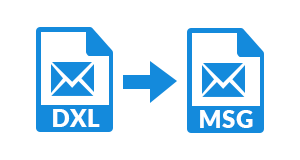 Instead of exporting complete DXL files from the folder, users can transfer few messages to Outlook MSG. 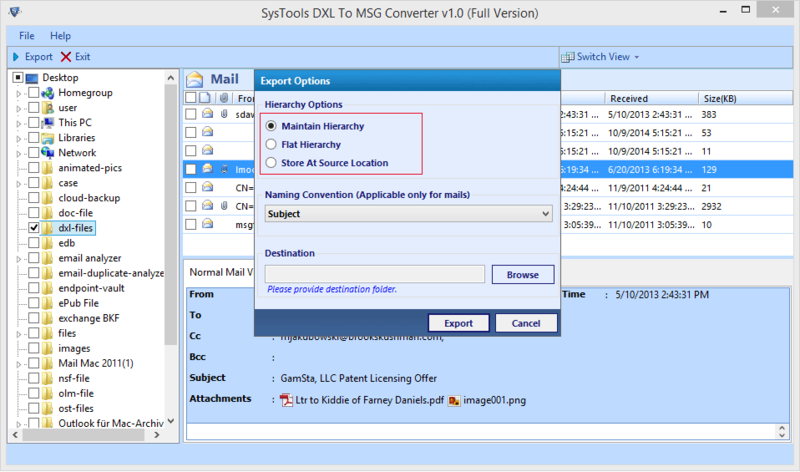 By default, the tool exports all DXL files into MSG in batch. For selective migration, users need to check all messages from preview window. Software will export checked messages only without any error statement. 1. Flat Hierarchy: Holds all DXL files in a folder but, does not maintain any folder hierarchy. 2. Maintain Hierarchy: Keep same hierarchy as of the original one. 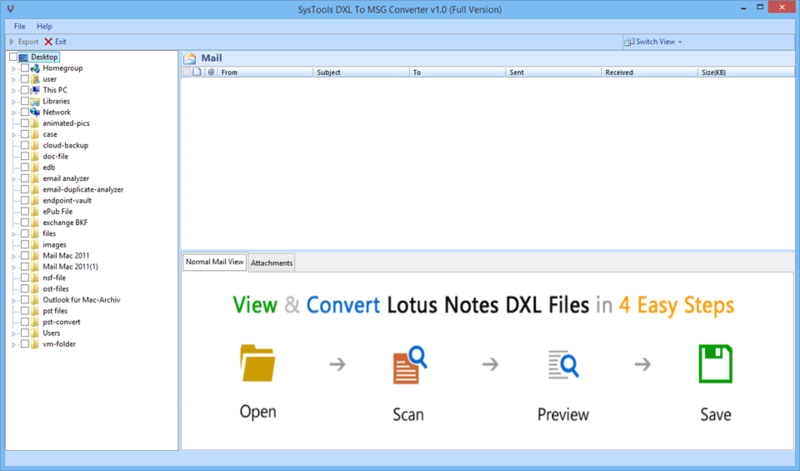 Lotus Notes DXL Emails to MSG converter offers a unique feature to change output file name. There are 5+ options provided by the software like : with MD5, AutoIncrement, Date + Subject + From, etc. No matter what is DXL file size, the tool will export file of infinite size. After giving commands for Exporting process, the tool shows live exporting procedure while saving files. Folder name and Item count of exported files are shown in the wizard. Apart from this, there is an option to create a new folder directly from the software panel. Will your converter operate on Windows 10 operating system? Yes, our software is Windows – based, which is easily supported on Windows 10, 8.1, 8, and all below versions. Is it mandatory to have the Active Domino server for working with your tool? No, not at all, our software is designed with smart and independent features. This means that software works in absence of the server and email client installation like Outlook, IBM Notes etc. It is an XML database file, which is created for the IBM Domino. It stores all data items from a Lotus Domino database along with design components, schemas, forms, views, and documents. A DXL file renders an export and changing database format. 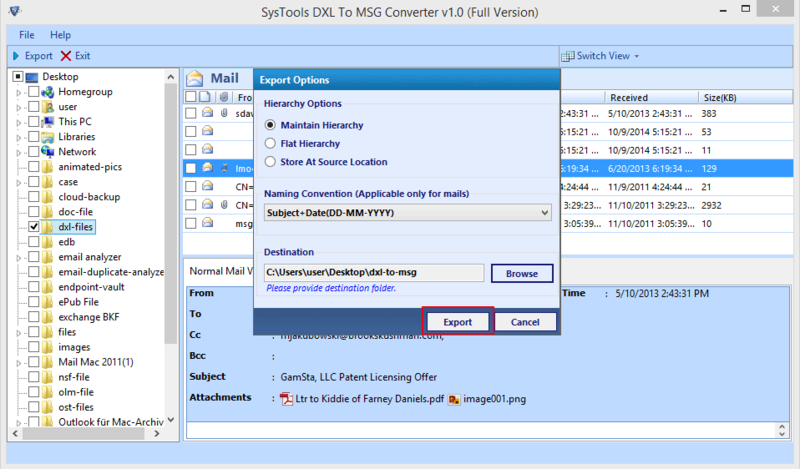 Will I be able to export selective emails with your DXL to MSG Converter? Download the software on your machine and install it. After a successful installation, launch application on your system. "I am the IBM Domino administrator in my organization. The management team of the company had decided to switch from IBM Notes to Outlook. Therefore, I started searching for software to export DXL messages to MSG. 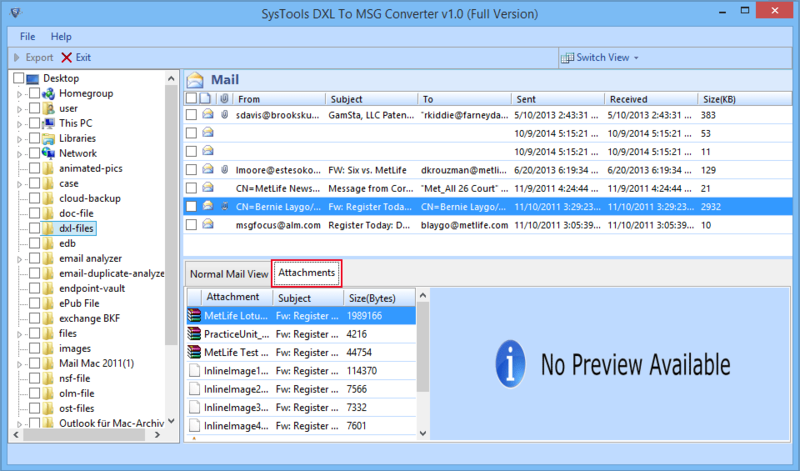 I have heard about this DXL to MSG Converter from many of my business friends. So, I decided to give a chance to this product. Really, it was awesome working with this tool. All emails were saved in MSG without any data loss!!" "Although I am not a person who write reviews for products on regular basis. But, this product forced me to do that. Due to some reasons I have to export DXL to MSG, which arose need to use this tool. The software working is beyond expectations! Well, all the features provided with it are powerful and brilliant. The point that amazed me a lost is its working interface. Really, its layout is awesome and so easy-to-use that I can guarantee that no other tool can provide such conversion."